Rael Automatic Sprinkler Company, the firm in charge of the building’s “massive, sprawling industrial sprinkler system,” wanted to digitize inspection records to improve traceability, automate maintenance schedules, and provide proof of compliance with federal and local fire and safety regulations. The case study lays out the challenges the company faced, the solution that it arrived at in collaboration with local integrator Automated Decision and technology supplier HID Global, and the benefits that this solution delivers. The document then goes on to explain how the system uses HID’s Trusted Tag Services and HID Seal eTamper tags to provide ‘proof of presence’ and to connect maintenance technicians and inspectors to relevant instructions, documentation and imagery when they scan the NFC tags on monitored equipment. 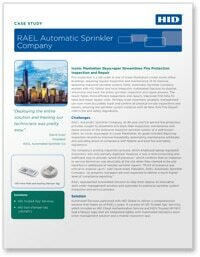 ‘Case study: Rael Automatic Sprinkler Company’ has been produced and sponsored by HID Global and approved by the NFC World editorial team. This two-page case study is available free of charge to NFC World Knowledge Centre members (PDF format, 270KB).